Ok, how would you like to have the ultimate fishing raft that you can camp on while you fish all night anywhere on a lake. Your own personal floating dock to fish from but that you can disassemble and tow on the smallest flatbed trailer or truck bed. A pic of me floating down the James River on my fishing raft made from storage bins and plywood. Well a year ago I figured out how to build the ultimate fishing raft. I volunteer for a troop of Boy Scouts at my church and when they asked me to plan an annual high adventure for the boys, we built several of these massive rafts and floated the James River in Virginia on them. There were 12 boys and three adults who floated with us and they all fit on three of these raft along with all their gear and supplies for the entire trip. At the end of the day we pulled the boats onto shore and camped on them. These rafts were incredible fishing platforms. They are ultra-stable wide so you can walk around and cast from anywhere on the raft with ease. The floated like corks and you could go class II rapids sideways or backwards and it did make a difference. I caught a tremendous number of small mouth bass floating down the James on those rafts. The rafts are constructed of three or four 4’x 8’ raft units attached together with 2×4 lumber on each side of the units. Each raft unit is kept afloat with ten 18 gallon sterilite storage bins that are bolted to the bottom. 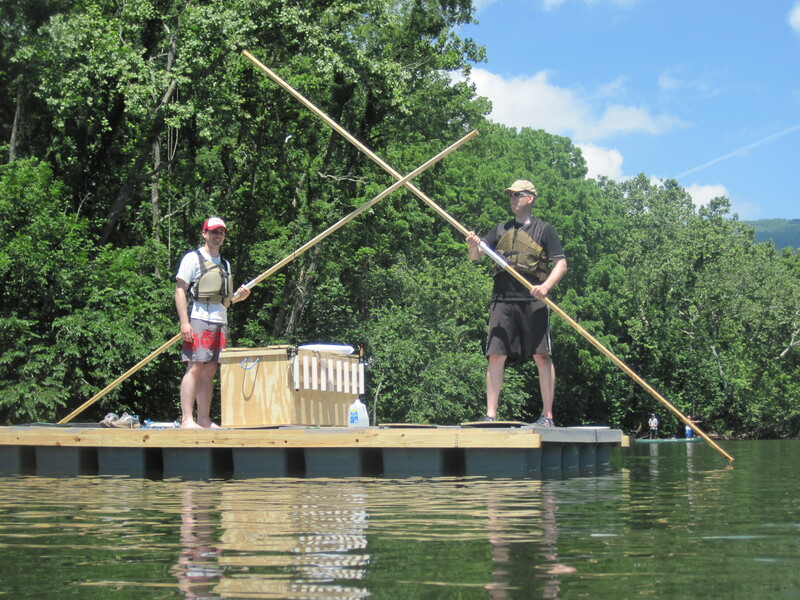 The rafts are maneuvered by two 8’ 2” x 2” rods that are coupled together by a section of 2” pvc pipe. The 8’ lumber is rounded by cutting the corners off with a table saw. This makes a great 16’ push pole. These are long enough to maneuver the rafts anywhere along the upper James River. Bellow I have included a supply list of all the raw materials you need and the sections you need to cut them into. Additionally you can see a video of How to Build the Ultimate Fishing Raft.